Hullabaloo started in Sandown, Isle of Wight as a one-day event in May 2017, but with support from Arts Council England became a two-day event in May 2018. It combines art with science and technology through workshops, parades, makers and inventors, a soap box challenge, music and more. Below are some of the articles featuring Hullabaloo. The return of Hullabaloo to Sandown last weekend saw an estimated 11,000+ visitors to the two-day event which combined art with ecology, science and technology and even a soap box derby! There are a huge number of activities taking place on 12th and 13th May across 80 hectares in Sandown Bay, from science discoveries to a soap box derby, kite flying and lego club to live music and a carnival parade. Don't miss these two days of free fun and discovery. After the debacle of the Sandown town council meeting on Monday, a Sandown businessman has made a generous donation to the town's Hullbaloo event taking place this May. The Sandown Town Councillor Chris Dupre was referred to by a fellow councillor as a "raging animal" after last night's meeting and there have been calls for him to step down. 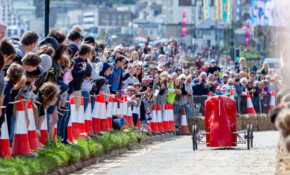 The Hullabaloo Soapbox Challenge takes place over the 12-13th May next year. 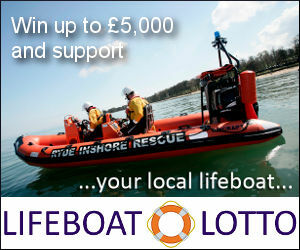 Head to the launch event to find out more about getting involved. Head to Sandown Bay on Saturday between 10am-10pm for this innovative annual event that combines the arts, community, health and wellbeing, heritage, environmental issues and much more.